Greenwich’s Megan Lynch won the 200 individual medley in a meet record time of 2:01.55 at Thursday’s FCIAC championship. For full story and more photos, please visit GameTimeCT.com. 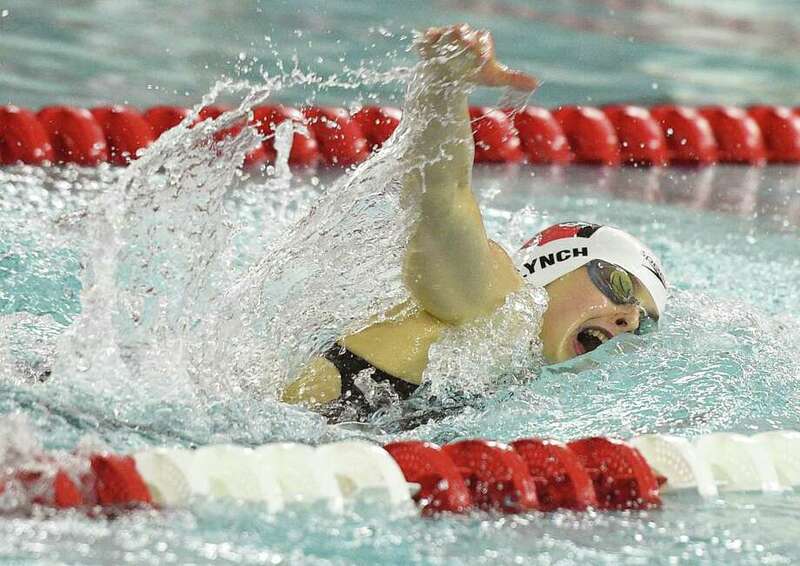 GREENWICH — Meet-record performances, personal-best times, school-record efforts — Thursday’s FCIAC Girls Swimming Championships had it all, including a repeat team champion. And the team that earned the sweet repeat is the squad that ended the meet in style. Winning the final event — the 400-yard freestyle relay — in an FCIAC meet record time of 3:31.28, put the finishing touch on a championship night for Greenwich, which won the conference title for the second straight year. The host Cardinals claimed the FCIAC championship with a team score of 363.50 points. Darien was the runnerup (298), followed by Wilton (265), Ridgefield (257) and Staples (254). Trumbull was sixth (212), New Canaan placed seventh (188) and Westhill/Stamford was eighth (146). Greenwich entered the meet with a sizable points advantage over its competitors by posting a lot of diving points, then increased its lead as Thursday’s meet progressed. Greenwich sophomore Meghan Lynch won two individual events and broke the FCIAC meet record in the 200-yard individual medley. She set the previous record at Tuesday’s FCIAC trials (2:04.26), then broke it last night, winning the 200 IM in an eye-opening time of 2:01.55. Staples’ Esme Hunter placed second in the 200 IM (2:04.90), followed by Darien’s Kaitlyn Holmes (2:08.75) and Lauren Walsh of Trumbull (2:09.26). Lynch also captured the FCIAC title in the 100 freestyle, touching the wall in 51.34 seconds. Darien freshman Kelly Dolce finished second in 52.69, while Wilton senior Taylor Loud took third (53.08). Mia Zajac of Trumbull placed fourth (53.21) and Lexi Punishill from Darien was fifth (53.48). “Swimming those events back-to-back was tough, but my whole team cheering me on really helped me,” Healy said. Cassandra Maroney (Darien, 24.50) finished second in the 50 freestyle, while Loud of Wilton placed third (24.55) and Greenwich’s Hannah Seward (24.71) took fourth. Zajac of Trumbull was a close fifth (24.77). Seward got the second-place medal in the 100 butterfly in 57.69 and New Canaan sophomore Alex Pastushan was third (58.46). The FCIAC Championships began with Staples winning the 200-yard medley relay in 1:47.22. Hunter, Annie Bowens, Healy and Sophia Mechanic represented the Wreckers in the 200 medley relay. Trumbull placed second (1:48.62), followed by Greenwich (1:48.66). The 200-yard freestyle saw Ridgefield junior Anna Turner capture the title, clocking in at 1:51.29. Junior Lauren Diagnault (Norwalk/McMahon) was the runnerup in 1:52.78, while Darien freshman Kelly Dolce was third (1:53.97). Ridgefield received fourth- and fifth-place finishes in the event from Rylie Giles and Stephanie Bishop, respectively. Giles was the 500 freestyle champion for Ridgefield, clocking in at 5:05.49. Greenwich senior Allison Brea took the second-place medal in the 500 freestyle (5:12.55), followed by Anais Wentzel of Wilton (5:12.89), Michelle Kennedy (Staples, 5:13.92) and Maya Watson (Westhill/Stamford, 5:15.71). The 200-freestyle relay saw Staples quartet of Hunter, Bowens, Lenoce and Healy swim an FCIAC meet time of 1:36.29. Darien was second (1:37.56), followed by Wilton (1:39.54). Hunter was the 100 backstroke winner (56.09), with Pastushan placing second (58.05) and Fairfield Ludlowe’s Lily Kernaghan taking third (58.17). Greenwich’s 400-freestyle relay squad of Emily Warner, Seward, Jenna Handali and Lynch ended the meet by winning the event in a meet-record time of 3:31.28. Ridgefield was the runnerup (3:32.74). Ridgefield’s Jenna Leonard took home the first-place medal in the 100 breaststroke (1:06.47). Trumbull coach Bill Strickland received an award for being named as the FCIAC Coach of the Year. Holmes placed second in the 100 breaststroke (1:07.03), followed by Walsh. Indeed, competing in the FCIAC Championships brings out the best in the numerous competitors. 200-yard medley relay: 1. Staples (Esme Hunter, Anne Bowens, Marissa Healy, Sophia Mechanic) 1:47.22; 2. Trumbull 1:48.62; 3. Greenwich 1:48.66; 4. Darien 1:50.56; 5. New Canaan 1:51.95; 6. Wilton 1:52.72; 7. Norwalk/McMahon 1:52.85; 8. Fairfield Ludlowe 1:54.75. 200-yard freestyle: 1. Anna Turner (Ridgefield) 1:51.29; 2. Lauren Dignault (Norwalk/McMahon) 1:52.78; 3. Kelly Dolce (Darien) 1:53.97; 4. Rylie Giles (Ridgefield) 1:54.18; 5. Stephanie Bishop (Ridgefield) 1:56.18; 6. Regan Ryan (Trumbull) 1:56.56; 7. Dariana Gonzales (Westhill/Stamford) 1:56.69; 8. Emily Warner (Greenwich) 1:57.56. 100 butterfly: 1. Marissa Healy (Staples) 54.91; 2. Hannah Seward (Greenwich) 57.69; 3. Alex Pastushan (New Canaan) 58.46; 4. Julia Nevins (Trumbull) 58.57; 5. Regan Ryan (Trumbull) 58.69; 6. Cassandra Maroney (Darien) 58.91; 7. Emma Babashak (Wilton) 59.96; 8. Elissa Clancy (Ridgefield) 1:00.13.